Kevin Williams, left, and Stephren Ragler, right, hoist up kids during some horseplay at the Walking School Bus gathering that takes place each weekday morning at the Alice Griffith housing project. At a community room at the Alice Griffith housing project just after sunrise, a bunch of squealing kids are sprawled on exercise matts, working on their abs. They’re at a before-school program and all of them live in the project’s new blocks of pastel-colored apartments — some directly above this room. When they stumble in sleepily, two young black men are here to greet them, for a little mind and body grounding. 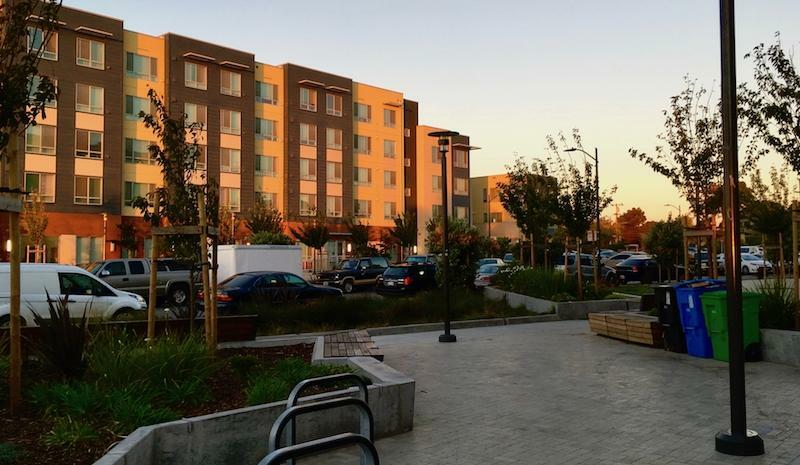 The Alice Griffith housing project, formerly known as Double Rock, is among four HOPE SF sites that have undergone redevelopment by the city in partnership with federal housing officials. HOPE SF has brought services in to the mixed income development, among them educational liaisons. 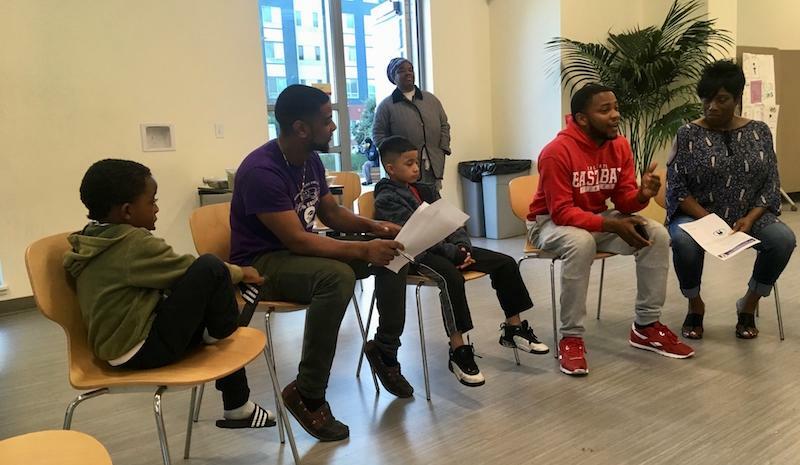 “If you can tell me why we meditate you can do a walking meditation, Felton,” Kevin Williams, the housing project’s educational liaison tells one boy. Felton nails the answer: “So we don’t have to get in trouble and we get our mind right, and we get every single paper A plus,” he says to murmurs of approval from the adults in the room. Williams is 29 with a neatly trimmed beard and today he’s wearing a purple T-shirt that says “School is My Hustle.” His sidekick is Stephren Ragler, who’s singing a little Bob Marley this morning. Ragler’s 23 with mellow energy. He sports stylish heavy-rimmed glasses and converse sneakers. He’s a student government vice president at San Francisco State University, too. San Francisco’s African American community has shrunk by half. since 1970, and of the families that remain, a fifth live in public housing or get a rental subsidy. So when the city decided to try to retain and support black families, focusing on public housing made sense. A city initiative called HOPE SF has been collaborating with federal housing officials to reimagine some San Francisco’s projects — including this one: Rebuilding them as mixed income housing and bringing in services: Nutrition classes, job training — and educational liaisons like Williams. Felton, right rear, and another girl help serve breakfast at the Walking School Bus at the Alice Griffith housing project one morning. After a quick breakfast, everyone piles out the door to walk to Bret Harte Elementary School just a few blocks away. Plenty of parents and guardians here have trouble getting their kids to school — for all kinds of reasons. Having Williams and Ragler as escorts every morning at what they call the Walking School Bus helps. Outside, one mom of a 3-year-old asks Williams if her son can join in. He goes to a pre-school that’s located at Bret Harte. Williams tells her sure. None too small to take part. Williams and Ragler aren’t teachers. They work for a neighborhood nonprofit called 100% College Prep that partners with HOPE SF to support kids in public housing. 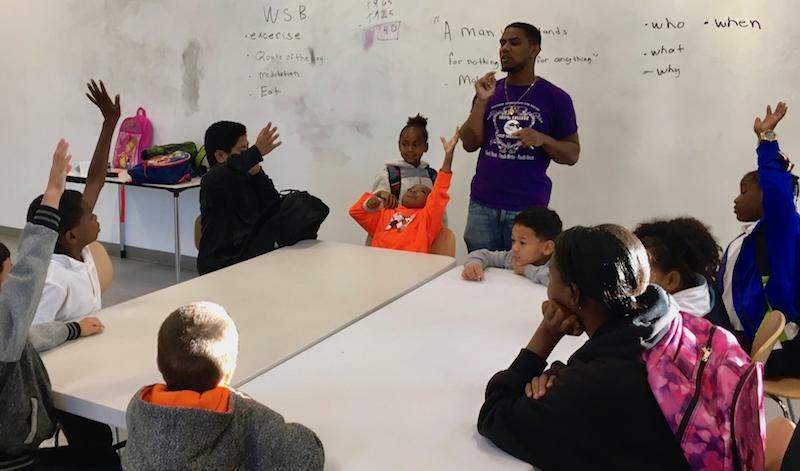 The men are grassroots educational advocates. And they’re important, because even a great school can’t give these kids everything they need to succeed. It takes more: more attention, more knowledge of their home circumstances. Williams and Ragler are part of a big web of support that’s surrounding the kids from this housing project. When their group gets to the crosswalk near the elementary school, it’s time for a daily ritual — a song, more of a chant really, that Williams wrote with help from the kids. “Keep it moving keep it moving, what? We ain’t got no time to be cruisin. It’s the Walking School Bus and the people we trust and at the end of the day all we got is US!” they shout. Robin Robinson, a grandparent volunteer with the Alice Griffith housing project's Walking School Bus, heads to the corner across the street from Bret Harte Elementary, where the kids sing their special song each morning. The chant’s a little thing, but as the educational liaison for the housing project, Williams is big picture: He tracks how all the children are doing in school and designs programs to help them do better. And Ragler? He follows the kids into the classroom, to keep an eye on them during the school day and help them with their work. Bret Harte Elementary’s principal, Jeremy Hilinski, loves these guys. Stephren, far left, and Kevin talk with students on the schoolyard of Bret Harte Elementary after arriving with the Walking School Bus. "They know all the kids," Principal Jeremy Hilinski says. 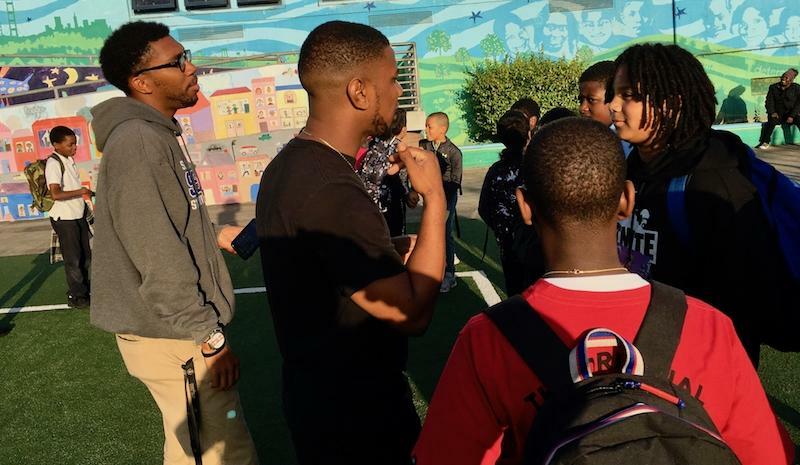 Some of San Francisco’s African American students are doing really well, and some are thriving. But data from the San Francisco Unified School District show that overall, as a group, black students post some of the highest absenteeism rates. HOPE SF data show that at half its sites — including the Alice Griffith housing project — African American kids were even more likely to miss school. 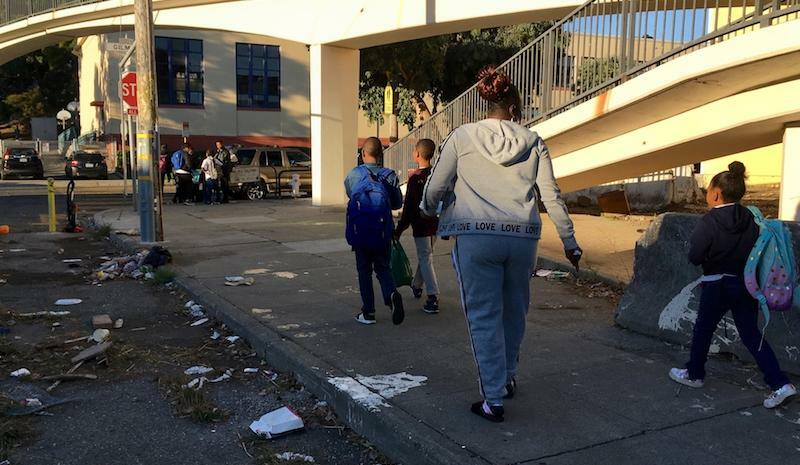 That’s why Theodore Miller, the director of HOPE SF created the position of “educational liaison” — to make sure these kids get to class. There’s more. As a group, African American kids by far score the worst on the district’s standardized math and reading tests. It’s been that way for decades — here and around the country. A recent analysis of data for students who live at the housing projects supported by HOPE SF showed their scores were even lower. That’s why Williams passes the baton to Ragler every morning. He usually spends about two hours in each classroom. He gives any student who needs it extra support, but he keeps a special eye on the kids from the Alice Griffith housing project who go to this school. This morning, he heads to a fourth grade class. It’s not a quiet classroom. The teacher spends a lot of time just trying to get students to calm down. Ragler stands in the back of the room. He notices one kid hitting himself on the head with a book and jots it down. It might mean the boy is struggling with something that’s distressing him — or he might just be bored. 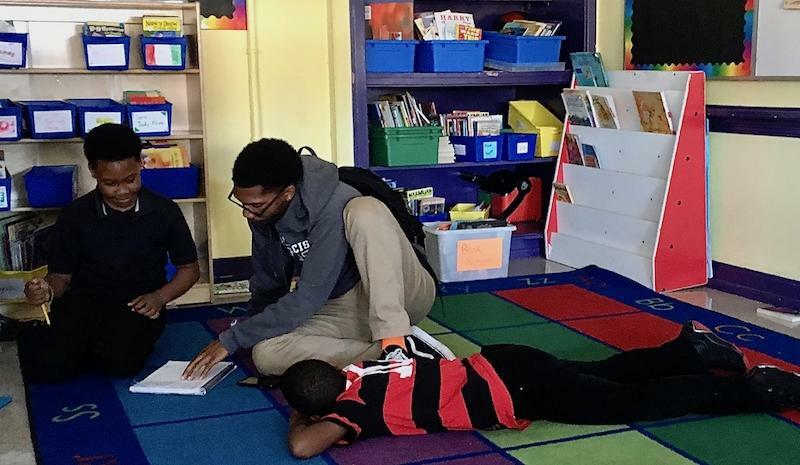 Some kids start doing their work — book reports in the form a letter to the teacher — and Ragler glides around, squatting next to them to help them out. He asks them about the books they’re reading, and helps them with their spelling. Stephren Ragler, whose title is student success coach, follows the kids into the classroom at Bret Harte Elementary School to help them with their work. Two of the students are in their fourth schools — and they’re only in fourth grade. That bouncing around makes it harder for them to trust the adults here. On this day, one boy — who Ragler says is super sharp — can’t sit still. Ragler tries to stick close to the boy, to show him some love. 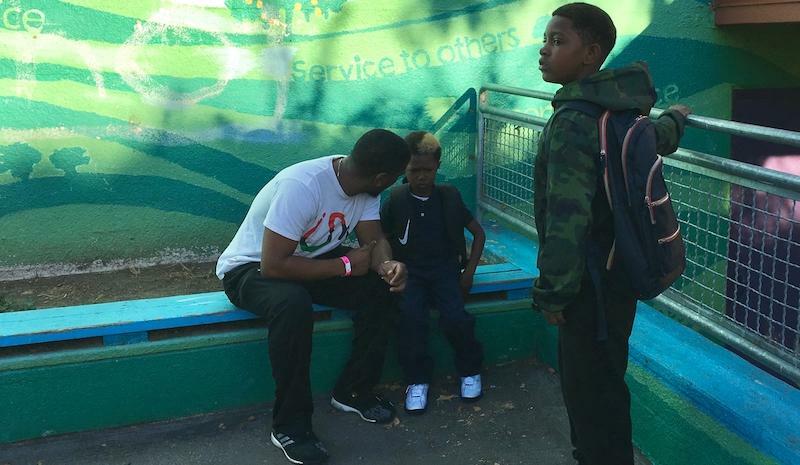 When a classmate taunts the boy, calling him “crackhead,” it just makes things worse. The teacher tells the other kid that’s unacceptable, but the damage is done. “I ain’t got my notebook!” he screams. “Why are you yelling? No one’s yelling at you,” the teacher tells him. Ragler moves in close to do something simple. Show the boy he cares, that he’s there. HOPE SF created the job of educational liaison in in public housing in response to high absenteeism rates. But HOPE SF itself grew out of something called the Seven Corners Study which looked at child behavioral health, child welfare, juvenile delinquency, school attendance problems. It found that the neediest kids in the city were concentrated at seven San Francisco intersections. Almost all were in or near public housing, and almost all were in disproportionately African American neighborhoods. The circumstances these kids contend with are all over the map, though. Some just don’t get enough sleep, Mom works graveyard shift, auntie isn’t as strict, they stay up too late, that kind of thing. Others are dealing with family deaths, and a lot more. Back at Williams’ office at the Alice Griffith development, he says lots of kids here experience violence and family addiction or incarceration. Kevin picks a different African or African American leader to discuss with the kids each week at the Alice Griffith housing project. There's exercise, breakfast, and meditation too, to help the kids self-regulate. "They've been exposed to a lot here," he says. If a kid’s a no-show or late to school, Williams tracks that parent down to say, “you know, we have the Walking School Bus as an outlet if you need it” and to ask if there’s anything else that he can do to better support them. About three dozen of the kids from this housing project go to Bret Harte Elementary down the street and the Walking School Bus is for them, but more than 200 school-aged youth live here and Williams is available to all those families. To get parents involved, he needs to strike a delicate balance. Not long ago he showed up in a van to ferry families to a district-wide enrollment fair in the Mission District. No one showed up — even though he’d alerted them two weeks in advance. To coax parents to nurture their kids academically, Williams runs a meeting once a month so they can all talk it out together. It’s a fall evening, and Williams is playing some R&B from his iPad. A big tray of turkey lasagna sits waiting. One grandmother and a couple of parents trickle in. A bunch of kids are going to be honored for strong attendance, but most of their parents aren’t here tonight. Attendance hasn’t been great and it’s a small group again. He pulls some chairs into a circle and gets going. Kevin Williams, the educational liaison at the Alice Griffith housing project, convenes parent meetings once a month. Regina Allen, a grandmother now raising her grandkids, is on the far right. Williams gets the group talking — about what works for their kids and how they can be more involved. They go around the circle, talking about the kinds of connections they’ve made with their kids’ teachers at school. When it’s time to eat, Grandma Regina says she’s appreciative. She didn’t expect to be raising her grandkids, but here she is, doing it. Having these meetings, some guidance, it helps. 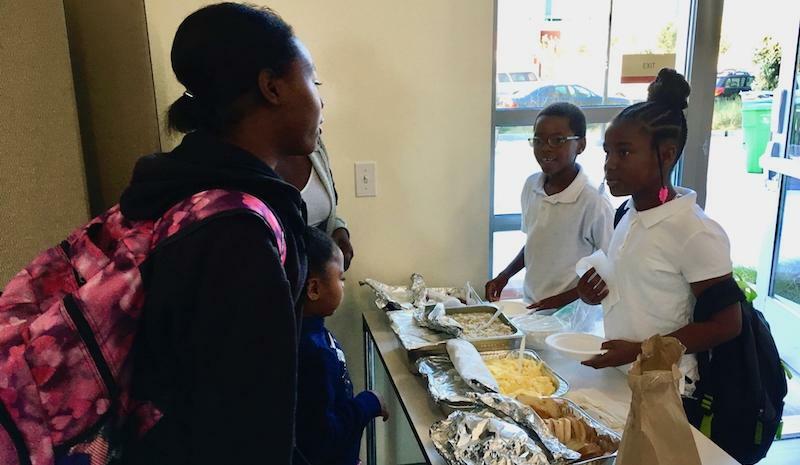 The goals of HOPE SF and 100% College Prep, the Bayview nonprofit that Williams and Ragler work for, are long-term — because raising the academic achievement of these kids won’t happen overnight. 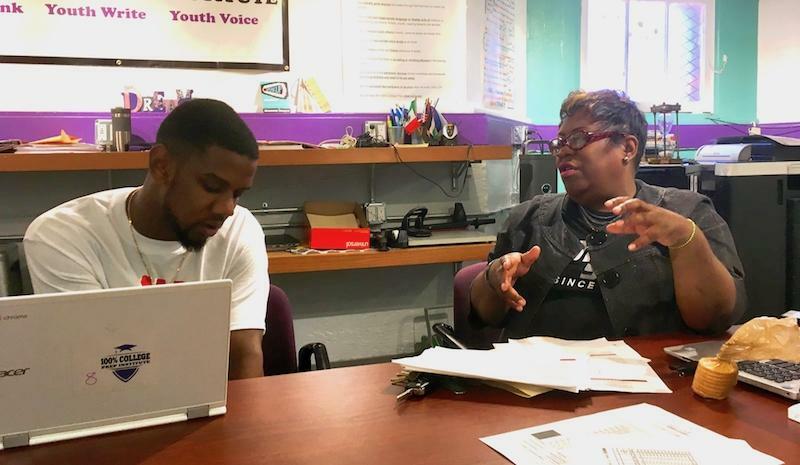 Kevin Williams, left, the educational liaison at the Alice Griffith housing project, meets with his boss, 100% College Prep executive director Diane Gray, to discuss a literacy campaign called Get Caught Reading. Williams is murmuring in agreement. “And then,” he chimes in, “it becomes one joint thing” to get parents to then help their kids read — billboards, grocery labels, cereal boxes or whatever. Getting parents hooked? That’s Williams’ challenge. And it’s a big one. A lot of his meetings are informal, he tells Gray, catching parents as they’re hanging out outside or heading to work.”Maybe I can pass out some newspapers,” he suggests, “‘Here you go, my brother,’” or, he says, it might help for him to just model that himself, by reading while he’s outside with them. He has to get creative, he explains, because some families that need the greatest support haven’t been coming to parent meetings. That’s where Williams’ one-on-one work comes in — like with one family that he’s been supporting for a long time. The mom’s youngest boy had been at a small elementary school where he got a lot of focused attention, he explains. Williams leads the way to mom’s home, up a steep dirt embankment, through a hole in a fence and past vacant units boarded up in an attempt to keep out squatters. Her name’s Yvette Blankenship and her family is one of just a handful still living in the old rundown section of the Alice Griffith housing project. They’re scheduled to move within weeks to a the newly-built pastel-colored apartment blocks. Blankenship, 48, has lived here for a couple of decades. She says it took her awhile to trust Williams, and embrace his help — with her older twin boys, who are high school freshmen now, and her 7th grade son, Dion. Yvette Blankenship, left, with her daughter, Danielle. Danielle is the twin of Dion, the 7th grader who has received support from Kevin Williams, the Alice Griffith housing project's educational liaison. Blankenship laughs, a deep warm laugh. She says she had to warm up to Williams but once she did, she got used to him “coming to get the boys, take them out to do more things, you know, showing them different things besides being right here,” like taking them to play basketball. Williams also helped Blankenship straighten out a housing problem that came up when her husband of 18 years left the family a while ago. The thought of losing her housing was stressful, and it came on top of other difficult circumstances. Not everyone in this housing development has experienced traumas, but Blankenship’s family has, and that affects not just her but her kids. Blankenship has Lupus and suffers from seizures. Her health took a turn after her oldest daughter was murdered nine years ago. Blankenship says she keeps the kids close, so they’ll be safe, and she makes sure they do their homework. For now, she says, they’re keeping their grades and attendance up. That’s really important to her. 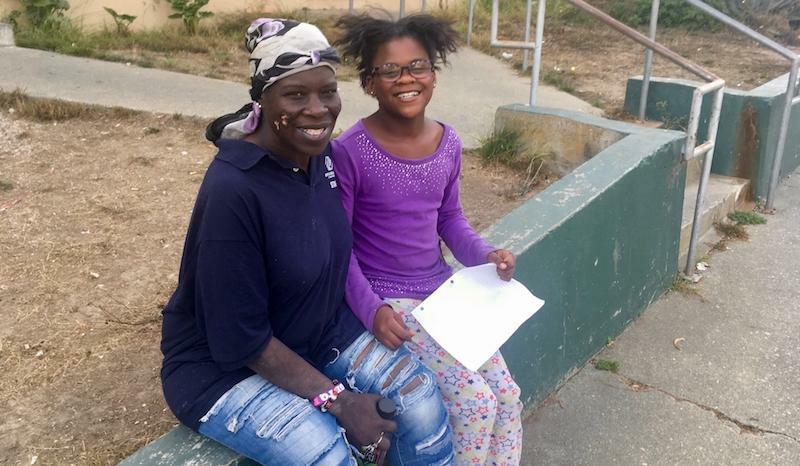 It’s too early to say whether students at the Alice Griffith housing project been doing better in school since Williams started doing this job in the fall of 2017, but by the end of that first school year, the number of Bret Harte students from the project deemed “chronically absent” dropped from half to less than a third. The school’s principal, Jeremy Hilinski, says those numbers fluctuate a lot. They go way up when families from Central America and Samoa take extended vacations back home, for example. But he says the Walking School Bus has definitely helped, and some kids who participate are really transformed, like Felton, who joins the Walking School Bus on a lot of mornings. 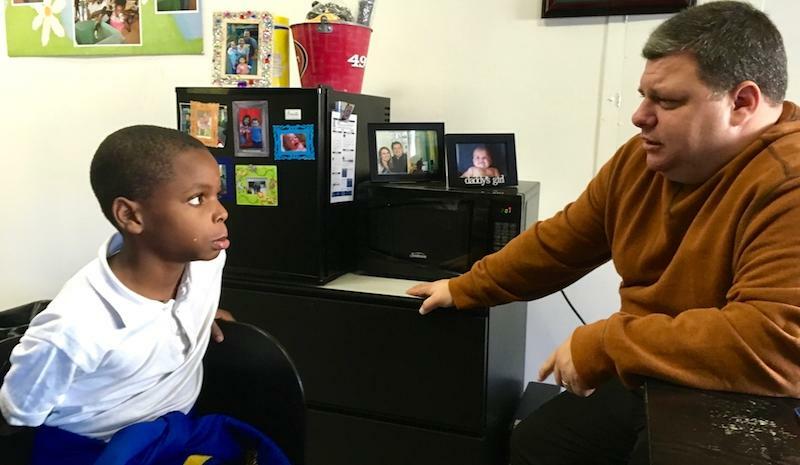 Felton, 9, talks with Bret Harte Elementary School Principal Jeremy Hilinski about how well he's been doing in school. Hilinski says it’s not just Felton’s behavior that’s improved. He’s doing much better academically. Because he’s calmer, he’s in class much more often. Lots of factors play into Felton’s happy turnaround. Principal Jeremy Hilinski says, every student deemed at-risk at his school — including just about all from the housing project — gets a one-on-one adult mentor. And lots more. The district uses a tiered system to channel extra support to schools with the neediest students. Bret Harte Elementary is Tier 3, the highest. So the school gets extra funding for literacy coaches and family outreach, and teachers get time and training to do a lot of group planning. But as schools improve, the district scales those resources back. The principal says his school nurse was already cut to half time a couple of years ago. So having Williams and Ragler around to focus on Felton and the other kids from the Alice Griffith housing project is a huge help. Kevin Williams, the educational liaison at the Alice Griffith housing project, talks to a distraught boy on the Bret Harte Elementary schoolyard. "They know all the kids," Principal Jeremy Hilinski says of Kevin and Stephren Ragler, who follows the kids into the classroom to help with their work. It’s slow work, though, supporting students one at a time. Williams and Ragler are on the job way more than their scheduled nonprofit hours dictate. They make sure the kids make it to weekend science fairs. They take them to the movies and zombie tag. Both men used to live in the neighborhood, but neither of them do anymore. Williams commutes from Daly City and Ragler from Pittsburg. Both men are part of that big out-migration of San Francisco’s black community, but they both get up before dawn, day after day, to do the Walking School Bus all over again. 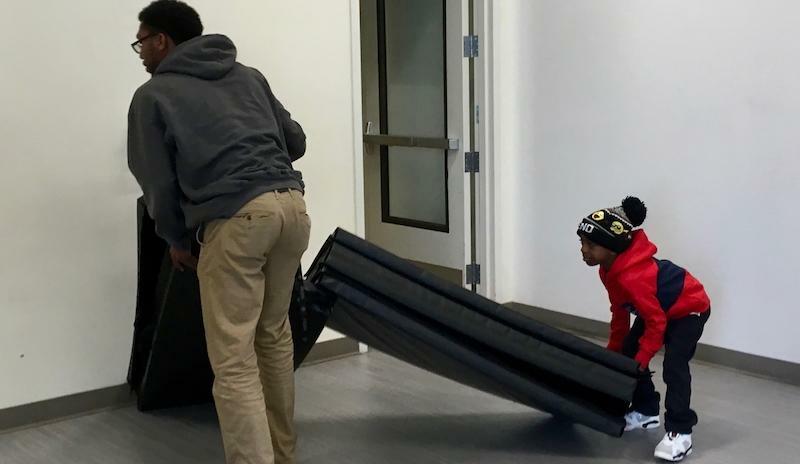 A little boy helps Stephren Ragler put away the exercise mats at the Alice Griffith housing project Walking School Bus event. “So listen, after we sing this song, I don’t mind if you guys run but we have to run where?” Williams asks the kids as they stand at the ready across the street from school. “Inside the crosswalk,” they answer in tired unison. Then they count down, and they chant. Then, they run. Inside the crosswalk. This story in the series, Learning While Black: The Fight for Equity in San Francisco Schools, was reported with the support of the Fund for Journalism on Child Well-Being, a program of the University of Southern California Center for Health Journalism. African American students across the country are much more likely than any other student group to be placed in special education, and that’s true at San Francisco Unified too. The district’s troubled history has plenty to teach us about what is and isn’t working for black students with special needs today.